Janice was named for the late wife of John Sharps who built the hull nearly 20 years ago while he was tutor in boatbuilding at Carrington Technical Institute (Now Unitech). 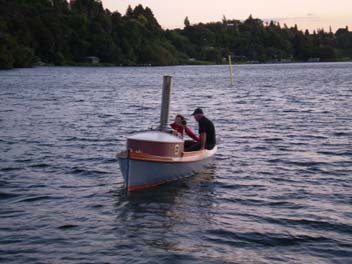 John is famous for his involvement in the design, building, and sailing of X -14' Class boats in the '50s, as an artist and a boatbuilder and designer. 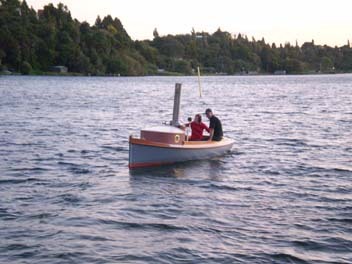 He also co-built the P Class yacht that was presented by the NZ Government to Prince Charles as a young boy. John's new steamer was moth-balled when he retired and moved north .His health and other pre-occupations prevented him finishing her. 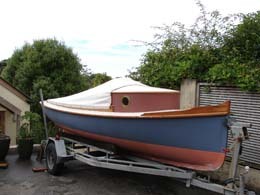 Nobody seemed keen to complete her as a steamboat, so I bought her from him several years ago and moved her to the Whangateau Traditional Boatyard for completion to my own specs. The pictures below show the progress. She was launched February 2007. These are three early shots of work in progress. 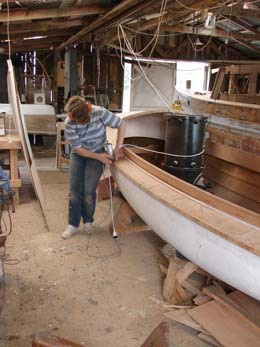 Left shows the boatbuilder hard at work fitting the rubbing strakes. 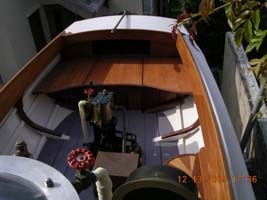 Centre shows the newly-fitted cuddy with the teak clad boiler in front. On the right, the first coats of paint are being applied. I feel that small boats need some sort of shelter forward -if only for the coal. Also,provided it isn't too boxy, it helps soften the profile. This series shows the machinery being offered up. 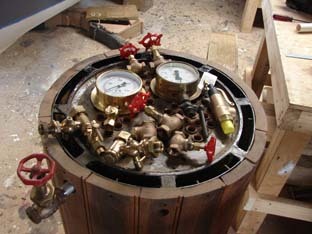 The various new boiler mountings are shown in the centre view. The teak boiler cladding is getting its first coats of spar varnish on the right. 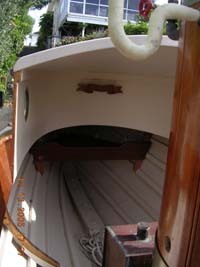 There is a layer of insulation under the teak which keeps the boiler well insulated and cool to the touch. The boiler is a wet firebox, coal-fired, vertical fire-tube. Copper fire-tubes ensure good heat transfer. Working pressure is 60 - 80 psi for best results, and max pressure is 100 psi. Stack blower, injector and whistle are fitted. The 2.5 x 3 engine was finished by local steam man, Wayne Larsen (who has built lots of engines and also supervised the building of the boiler), and is shown ready for installation. 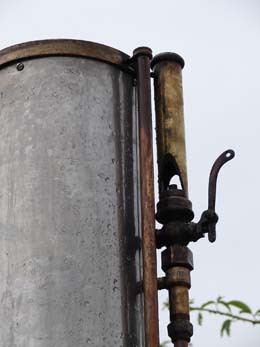 The sole plate, cylinder and valve chest are made from patterns made by John Sharps. Reversing is by Stephenson's link. 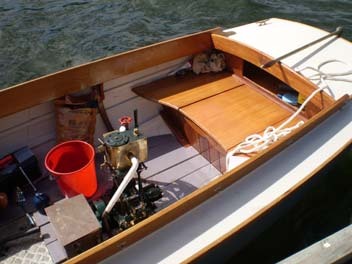 There is an air pump and twin feed pumps driven by levers from the crosshead in traditional manner. 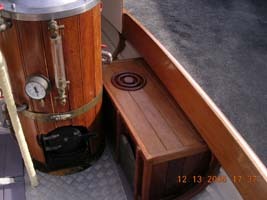 An oil box has copper pipes leading to all the main lubrication points. The engine is very powerful and gives a good turn of speed provided the stoker pays attention to his fire. 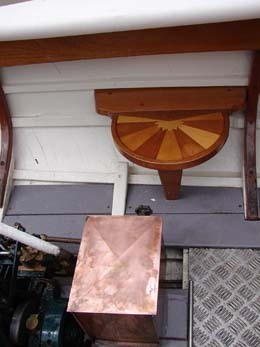 Exhaust steam passes to a keel condenser and the condensate is lifted via the air pump on the engine and passes to the hotwell (visible just forward of the engine). The feed pumps draw the water from here and feed it to the boiler. Thus minimal water is consumed. 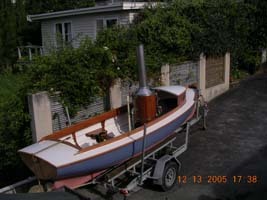 The almost-finished Janice about to be taken down to Auckland for machinery installation and pipework. 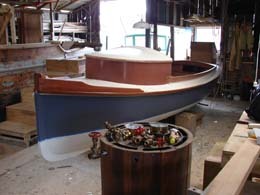 Here is the new steamer on the slipway at the Traditional Whangateau Boatyard ready for launching February 2007. There were plenty of people to wish her well and lots of boats in attendance. A good helping of coal and plenty of pressure, and away we go to get our other two passengers! It took me a while to get used to firing this sort of boiler once more. 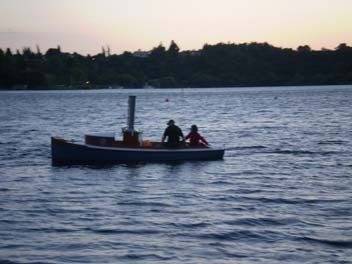 These pictures were taken at the Boat Parade where we were pleased to receive an award of a bottle of bubbly for our mechanical efforts: We were thirsty! Janice had minor teething adjustments needed but otherwise ran well. She is a nippy little boat! A bit of twilight steaming. 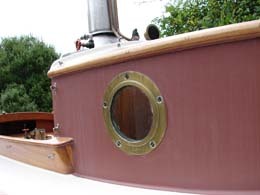 Here are some detail views of the ship. Fo'c'sle cuddy -room for two close friends to shelter or stowage for supplies. You can see Janice's carved nameboard at the foreward end. Reserve feedwater tank just in front of boiler holds10 gallons. The injector draws from this tank. Decent canvas cover keeps the cats out when not in use. The funnel is dropped and stowed when Janice is under tow. The trailer is robust and has wof and registration -it tows well. Looking down on to the boat. 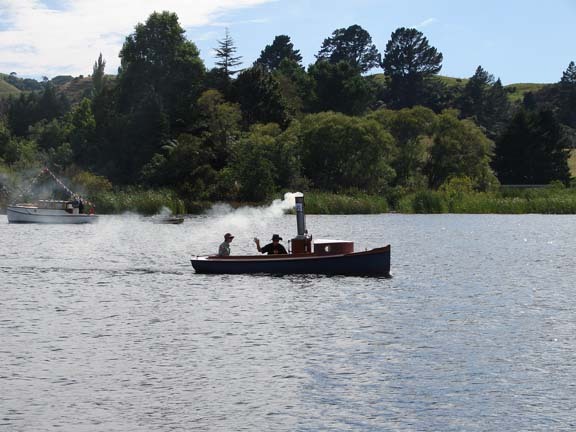 Since 1987, I have had three steamboats. Gypsy, Romany and Janice -I love Janice but she is just too neat for me and needs an enthusiastic owner who loves polishing brass and attending to the tiddly bits. She steams well, runs well, and two up is ideal. I have a safe steaming protocol for the ship. My asking price for Janice is $42,500 ono, which I think is fair because of the costs involved in building her. My contact details: phone numbers +6494457088 02768784773 email: mrward<at>steam.co.nz.